This is just so mesmerizing to watch and the artist has such control of the paint. Alas my process is not quite as mesmerizing or as neat. I did find another video where the artist uses various stylus heads to apply the dots (much easier) for those who want to give it a go. 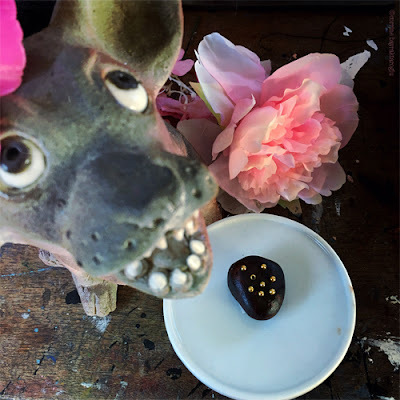 I generally gesso my stones and may use a pencil to draw the design first, sometimes I use acrylic paint, or Posterman Pens and may add oil paint. In this one I used oil paints. 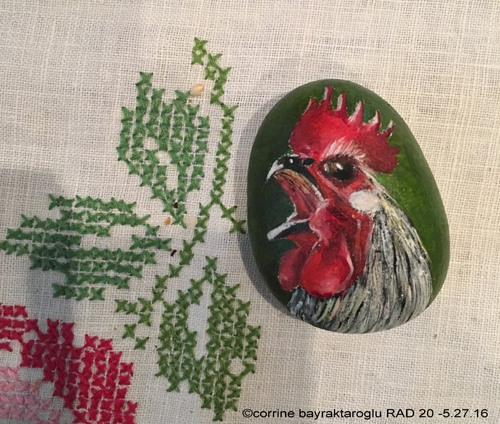 This is part of a series of stones I paint each time I do a radiation treatment but this isn't the first time I have painted stones. 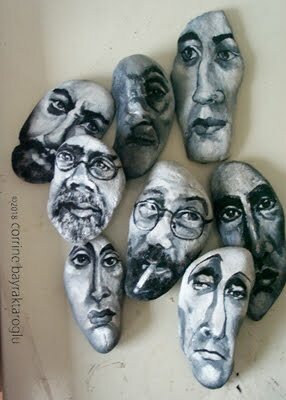 Back in 1999 I started painting portraits on river rocks I found in New Jersey. We had just moved to NJ and on a walk with my husband by a river I was feeling somewhat down about not having my studio set up. My husband picked up a river stone and said why don't I paint on some stones until I get the studio set up. There was something intriguing to me about manipulating the paint in a way so that viewers couldn't tell if it was the shape of the rock or how I painted it that defined the features. Some of these stones ended up being embedded in a wall in a custom house in Las Vegas, some sold in frames, and I still have one or two. The Chuck Close stone is currently on display in town in the jafagirl art box. For those interested in painting stones I found a great site that has a step by step guide which I hope you enjoy. 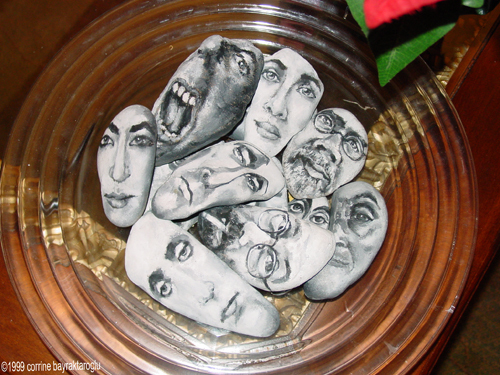 I have recently discovered the enjoyable craft of decorating stones. What's not to like? Your canvas is free! Okay, maybe it's not so free if you actually purchase a bag of stones from Michael's Crafts. But that's still okay. Stones are cheap no matter what! Advanced Style is Ari Seth Cohen's blog-based ode to the confidence, beauty, and fashion that can only be achieved through the experience of a life lived glamorously. It is a collection of street fashion unlike any seen before-focused on the over-60 set in the world's most stylish locales. of the hats, and sunglasses. I love the whole attitude of wearing what we want and on our own terms. However it's NOT Advanced Style that is the problem but some of the comments, and the articles/ memes/posts telling us this is how we "should" age that really started to rub me the wrong way. So this isn't a criticism of the blog, or anyone who enjoys using fashion/stylish clothes. My criticism lies in the implications that others have placed on older people who don't choose or can't afford to wear stylish clothes. 24 Seniors Who Said "HELL NO" to Old-People clothes. The first thing I thought of was what the hell are "old-people" clothes? If old people clothes are easy to wear stuff, then hell, young people wear those too. The statement that they are doing it right implies that anyone who doesn't dress like this is doing it wrong just comes across as an ageist dismissal and it adds to the superficial expectation that an older person's validity is only relevant if they dress stylish. 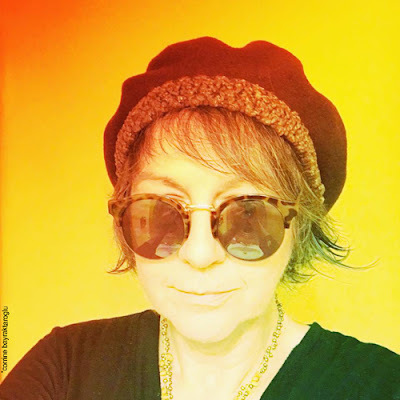 As Ashton Applewhite stated on her blog yo, Is This Ageist, "there is no right way to age or to dress". Even though Advanced Style has exposed how being older doesn't stop us from being stylish or creative, the downside is that many are dismissing women who are deemed as dowdy and therefore boring. What is wrong with DOWDY, whatever that is? Isn't it kind of sad that the only way we can feel empowered and visible is by wearing fashionable eye catching clothes. Isn't that really just a societal band aid solution and not really about accepting ageing. If we want to change the perception of ageing doesn't it start by accepting us as we are, as we choose to be, stylish or not. I have to include this because I LOVE this project. Check out the article in the Boston Globe - The Old Bags Project spotlights the insidiousness of Ageism. "When you feel comfortable in your clothes, you look good. When your shoes fit right and your dress isn’t too tight, you can forget about your looks and show off yourself. There’s so much concentration on exterior beauty, you can wind up saying “I can’t go to this party, I have nothing to wear.” Who the hell cares? If you’re bringing yourself and you’re a nice person, you’re the life of the party." "In order to see birds it is necessary to become part of the silence"
As I sit in the garden, with camera in hand, I watch and listen. 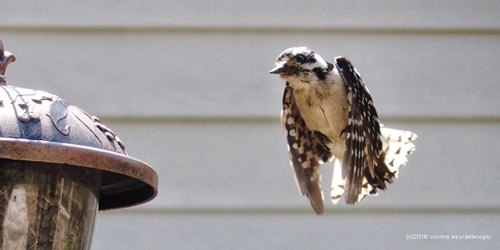 I have come to understand the pecking order of our resident birds as they do their aerial dance around the feeder. There are our territorial pine tree red cardinals, the front garden bois d'arc bluejays, redwing blackbirds, chickadees, finches, doves, sparrows and woodpeckers. The bluejays work in tag teams and are aggressive little stinkers. We don't often get woodpeckers at the birdfeeder but this one was very intent and wasn't going to let the male red cardinal get in the way. 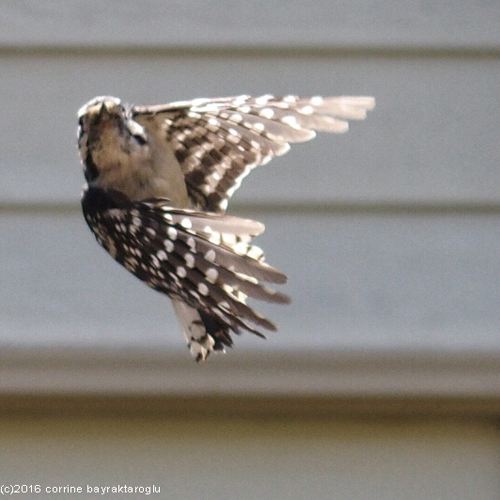 "Even the woodpecker owes his success to the fact that he uses his head and keeps pecking away until he finishes the job he starts." 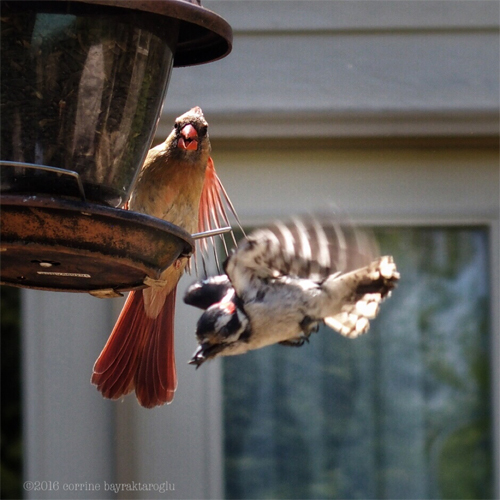 The Red Cardinal had this look like "EXCUUUUUSE me" but the woodpecker got his sunflower seed, and off he went. On one of my daily radiation days my friend Karen came along and brought a magazine to read while waiting for me. The plan after treatment was to go thrifting and then a curry BUT there was something in the magazine that just got us drooling with excitement and a new trip was added to the list, a craft store. Alas the craft store didn't have anything like epoxy putty so I had to order it online. 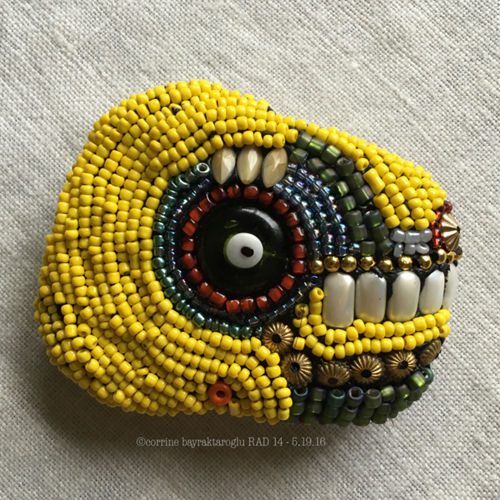 It also determined what the theme of my daily stone was going to be, something beaded. time is limited to a window of time before the epoxy sets. Mix too much and you have to rush to use it all. I think next time I make a mosaic I will follow the advice in the tutorial that you can find at Cloth-Paper Scissors . This putty comes in quite a few colours and I chose black and I LOVE it. I have been looking for something like this for years and it really does make it easier to attach things than glues. So thank you Cloth Paper and to Katherine England, whose name we loved of course since Karen and I are from England, for the inspiration. One of the things I am finding I need to do after Radiation Treatment in order NOT to cave in to fatigue, although at this point it isn't really too bad, is get out of the house. Not hard to do since I love walking and taking photographs. 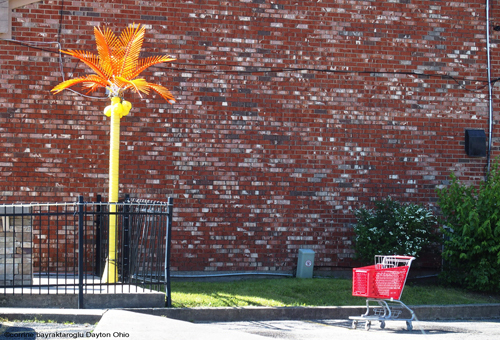 My curry pal, KAOS Queen aka Karen Jane Russell, and I went thrifting after my treatment and I don't know why but the juxtaposition of thrift store cart and an exotic looking enticement to the bar/restaurant next door struck me. The thought of sipping a rum punch with midwest traffic whizzing by under grey skies, and runaway shopping carts nearby isn't quite the same as a sunny beach and the heady beat of reggae beckoning your body and soul. 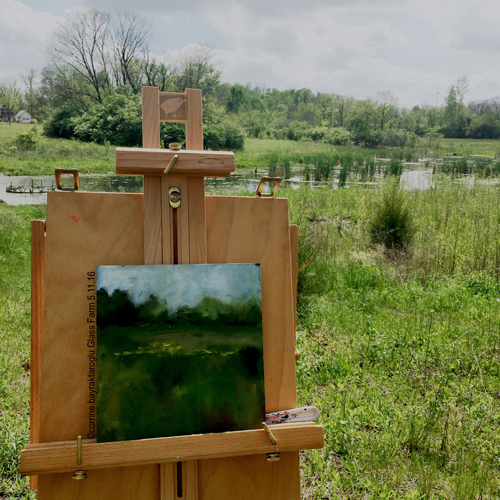 I was going to say this is the first time I have gone Plein Air Painting, but actually the first time was in Annapolis, Maryland many many moons ago and it was a comical exercise. While my pal George, fag hanging from his lips, painted happily dipping an old sock into his paints and rubbing paint over wood panels and creating masterpieces I was fighting off a pesky dog, wind and bugs. Either the wind knocked over my easel, bugs or leaves got stuck in my paint and this dog decided I MUST pet it constantly or else it would whine, bark or knock my legs. After 2 hours I gave up with nothing to show for it. 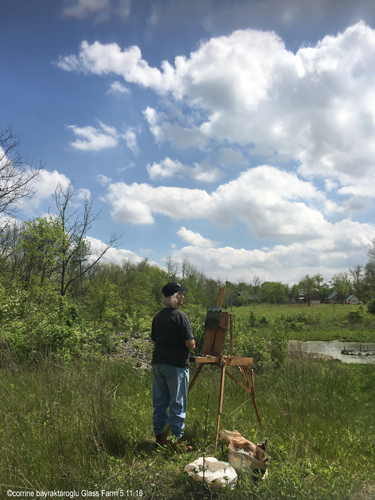 and Christine Klinger invites me to try Plein Air once again at Glass Farm. No dogs and no wind this time :) Just us and the sunshine and the pond critters. It was a lot of fun BUT I'm going to rethink supplies and locations before I do it again. Even with a big hat on, without shade I was beginning to suffer after an hour and during radiation treatment being out too long in the sun is not a good idea. Landscape painting is not my forte and so it was definitely out of my comfort zone, but that is part of the reason I did it. I am not displeased with the effort. On weekends my husband and I like to take drives on the beautiful backroads of Ohio and I spotted a town on the map called Knockemstiff. Isn't that just a GREAT name? Legend has it that a "woman asked how she could get her cheating husband to stay home. "Knockemstiff" the preacher replied" Hence the one of many stories of how the town got its name. KNOCKEMSTIFF, Ohio - Ardith Chaney, 85, brings out a framed, yellowed newspaper clipping that she keeps with other memorabilia in her house along the highway through this hamlet in south-central Ohio. It shows the exterior of a seemingly deserted general store, an old-fashioned gasoline pump dating it as decades old. 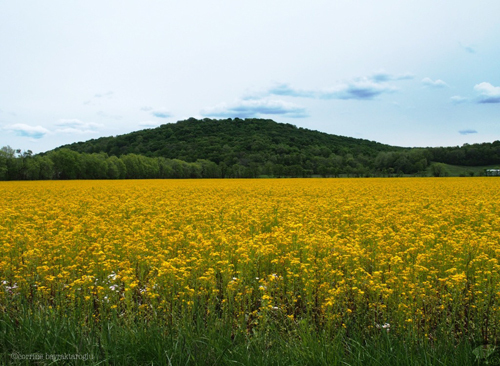 We shy away from reading up or following guide books and just drive and enjoy the surprises. Unfortunately we went through it not even knowing we had driven through it lol! There is no town sign (apparently it got shot up), or main street,and it really is a ghost town, but we were delighted a few miles out with this glorious scenery. A Letter From Knockemstiff and getting their noses out of joint. "knockemstiff was a moonshine haven during Prohibition, which offers another explanation for the town's name---that the moonshine would "knock 'em stiff". According to historical research, the moonshine developed here carried such names as Coffin Varnish, Tangle Leg, Stagger Soup and, not surprisingly, NockUmStiff"
I don't feel depressed or particularly fearful now, but using my art is helping me cope with the daily ritual of having to go 5 days a week for radiation. Since I am forced to do this ritualI figured I could add some fun daily rituals, including art related one's, so here is my list. Ritual One: Get a treat after each radiation therapy (a wee candle, a little charm, a sinfully delish cupcake, earrings, thrift shop find,lunch with a pal, a new scarf, an afternoon movie, an art related item). 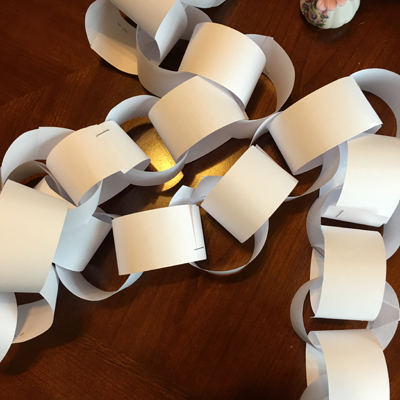 Ritual Two: Remove a link off my countdown paper chain and write what I'm grateful for for that day and put in gratitude jar. Ritual Three: Take a photograph of something that make me happy and put in journal. Ritual Four: Pick up a stone each time I leave the hospital parking lot and paint it. RAD DAY 2 stone is painted to look like a piece of chocolate because early in diagnosis I got a MEGA craving for chocolate. I can't tell you how glad I am that craving is OVER! While my paperchain recedes, my bowl of stones increases and at the end I will have a bowl of fun art. Not everyone can do art, but there are simple things you can do. Such as getting a free butterfly template and colouring one each day and adding it to a wall. 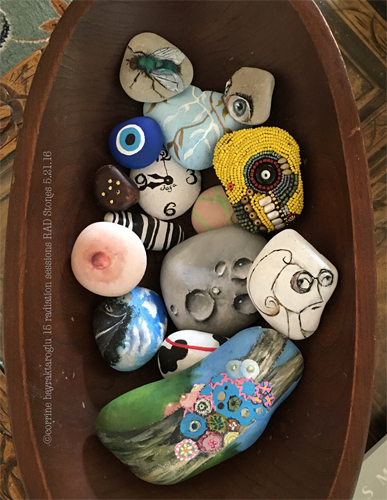 Collecting stones and writing a comforting word, OR how you feel (very sweary or angry) and at the end of treatment have a smash party. Collect old cracked china cups or plates, line them up, get together with your family or friends and take turns trying to smash them. Decorate an "End of Treatment Trinket Box", and each day during treatment add something, or ask a loved one/friends to add something. It could be a feather, a child's drawing, a thrift store trinket, a photograph, a piece of your fave fabric, a scrap of paper with how you feel that day, a fave cd of music, a smelly candle, a coupon for ice cream or spa day. Sky's the limit on what you or your loved one's/friends choose to put in the trinket box and at the end of treatment you open and enjoy. "Art washes away from the soul the dust of everyday life." 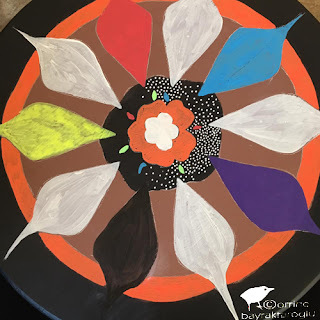 - Pablo Picasso Art therapy is a broad term used to refer to the practice of creating as a way to heal wounds of the mind or spirit.